A lovely blue 22 inch "Drophead Dragonfly" shade, model #1507. Very desirable colors. It rests on a "Water Lily," standard, "twisted stem," model #443 base, for a model #1502 shade. 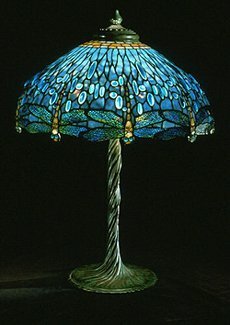 This is a rare lamp to find and very valuable.